Mount Pleasant is one of the city’s most vibrant and fastest-growing neighbourhoods, with an anticipated local growth in electricity demand by almost 40 per cent in ten years, and 80 per cent in 30 years. To meet that growing need, BC Hydro commissioned construction of the new Mount Pleasant Substation; the first to be built in the city of Vancouver since 1984. 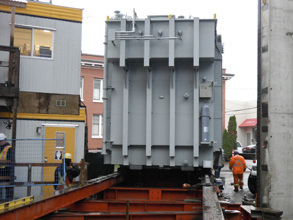 The team at Locher Evers International coordinated the trans-continental shipment of the two 140 ton Transformer Units and selected Supreme Structural Transport for their delivery from Shipside through the narrow Vancouver City streets to their new home in a 2-story building in the congested city centre. 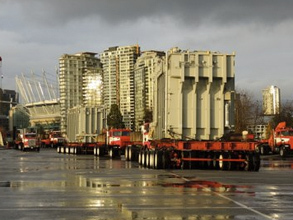 Transportation by barge and roll-ashore discharge in Vancouver’s False Creek. Extreme requirements for transporter maneuverability and load distribution in tight city streets. Jack and Slide procedure (with rotation) to install the transformers accurately on their new foundations. Posted on January 15, 2018 by Jessica Christensen This entry was posted in Featured Projects, Industrial Transformer Project. Bookmark the permalink.